Walking on crampons, across crackling glacial ice, mine as well be walking on the Moon or Mars. You may not be weightless, but the scenery is other-worldly. Ten percent of Iceland is covered by glaciers, with Sólheimajökull Glacier being one of the most frequently visited as a day trip from Reykjavik. During my recent visit to Iceland, I teamed up with Arctic Adventures for their Blue Ice tour, which promised three solid hours on the glacier. Weather-wise, I'd lucked out with my visits to Franz Joseph Glacier in New Zealand, and Perito Moreno earlier this year, but Iceland decided to present a challenge. 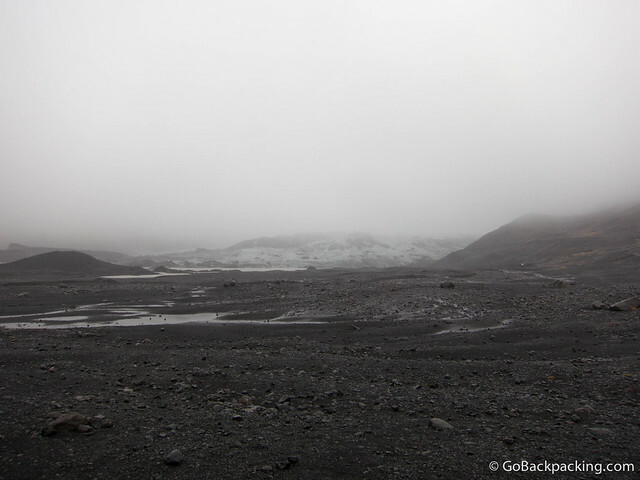 Grey skies were hovering over Reykjavik when Oskar, our glacier guide, picked me up from Kex hostel at 8:30 AM. Along with a British woman, and a Qatari student living in London, we commenced the two and a half hour drive to the edge of Sólheimajökull Glacier. Halfway there, we stopped to grab some snacks at a gas station. A packed lunch was provided as part of the tour. We also made a quick stop at a viewpoint for Eyjafjallajökull volcano, which erupted in 2010, forcing airlines to cancel their flights due to the resulting ash cloud. Due to the low visibility, we couldn't see the volcano beyond the farm that stands between it and the road. A light rain was falling much of the time, and as you can see in the photo above, the views were a bit misty upon our arrival. In the shelter of the van, I donned water-resistant pants and boots that I rented for the day (at a cost of $13 each). I knew my jacket was good, but the alpaca gloves from Peru weren't going to last long if the rain kept up. In Patagonia, I'd paid $50 for waterproof gloves I wore no more than twice, so I decided I could suffer a little on this occasion. Once we were suited up, Oskar handed out crampons and ice axes, and we began walking across the rocky moraine. In 2000, just twelve years earlier, the glacier reached as far as the parking lot. It'd retreated a few hundred meters in that time. As we stepped onto the glacier, the sound of rushing water could be heard. This wasn't a trickling stream, it was a raging torrent. And all that water, in liquid form, was a constant reminder of how the ice underneath us was in a constant state of flux. 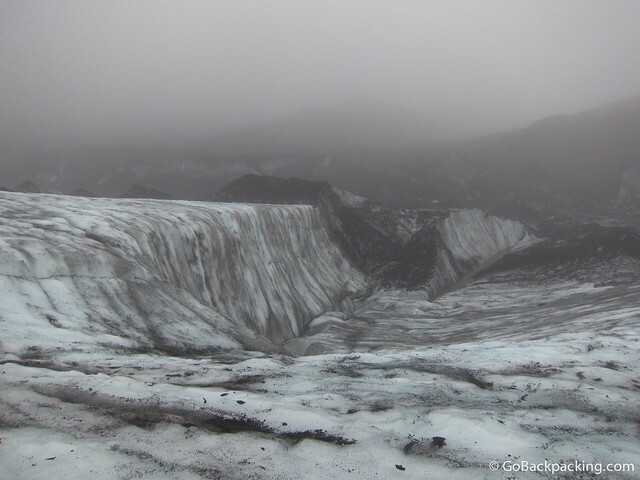 Sólheimajökull Glacier is covered in black volcanic ash, which collects in little black pools across the pockmarked surface. Looking down at the ice, it's as though one is walking across a landscape of inkwells. 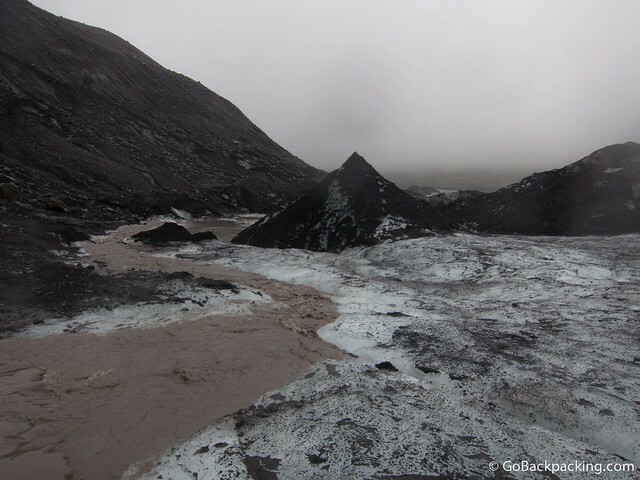 When I first saw pictures of the glacier, I wrote it off on account of how dirty it looked. Most glaciers are marketed for their pristine white landscapes, therefore that's the image tourists have in mind when they finally have the opportunity to visit one in person. But the more time I spent on Sólheimajökull, the more I began to appreciate its unique landscape. The ash was a constant reminder of the geologic forces that created our planet, and continue to shape it to this day. During the Winter, fresh snow covers much of it. Oskar informed us that the coarser, pebble-sized ash was due to an eruption in the early 20th century, while the finer, silt-like ash was due to the more recent, 2010 eruption of Eyjafjallajökull. 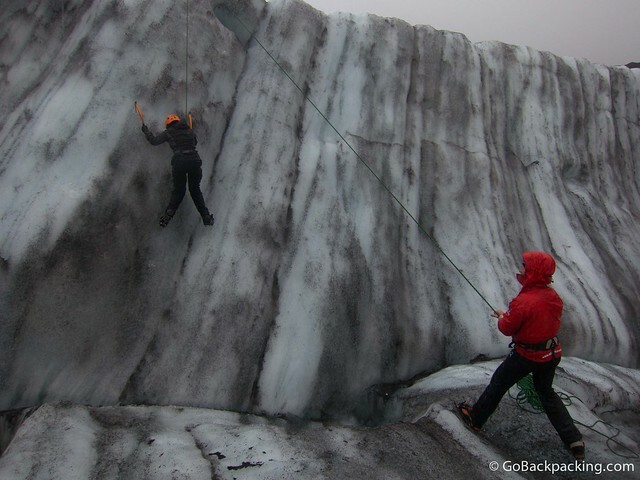 An hour into our glacier hike, Oskar led us to an icy wall where we'd each have the opportunity to rope up and try our hand at ice climbing. I was excited by the prospect of holding ice axes again, which is part of why I chose the Blue Ice tour. Being the only one with prior ice climbing experience, I volunteered to go first. I began plunging the curved, technical ice axes into the wall, stepping up one leg at a time. It didn't take long to reach the carabiner at the top, and signal Oskar that I was ready to come back down. The others then took their turns, including a British man who joined our tour once we'd reached the glacier parking area. On the way down the glacier, which was a more precarious affair than going up it, we had semi-clear views of the meltwater lagoon. The rain had let up a little during our ice climbing, but it wasn't long before it was raining harder than when we arrived. My gloves were so wet and heavy, I had to stop wearing them if I wanted to keep taking photos. Needless to say, we were all happy to reach the van again, where layers were stripped off, and we could sit back and eat our boxed lunches. 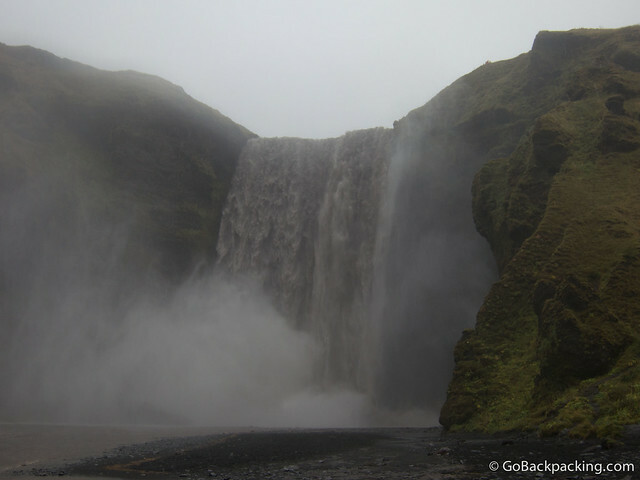 On the return trip to Reykjavik, we stopped at Skógafoss waterfall. There was a pathway leading to the top of it, which I would've walked if I weren't so waterlogged by that point. 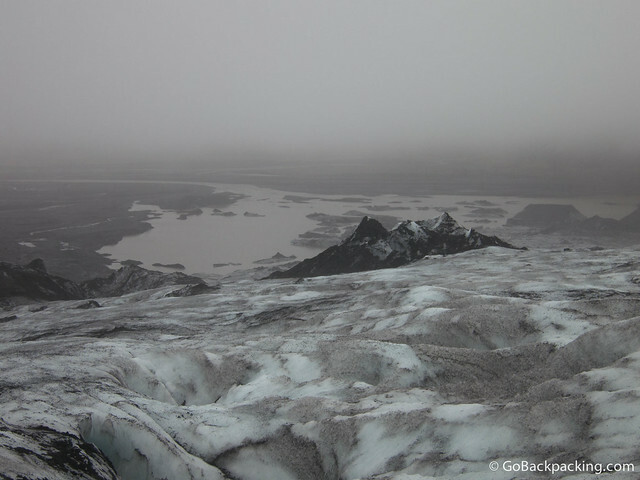 The weather is unpredictable in Iceland, and despite the rain, I had a wonderful time on the glacier. I'd encourage anyone visiting Iceland to book a glacier hike. Alternative options include snowmobile trips and super jeep rides if hiking and ice climbing aren't your thing. Disclosure: My Blue Ice tour was in partnership with Arctic Adventures. Looks so beautiful Dave. I’d prefer a destination like this over a touristy beach or “pristine” glacier any day. Thanks for the info and keep climbing! Seems like an amazing journey. I am new to blogging and just reading a few different ones to get an idea. I have done quite a bit of traveling as well but its always fun to hear about other peoples experiences. 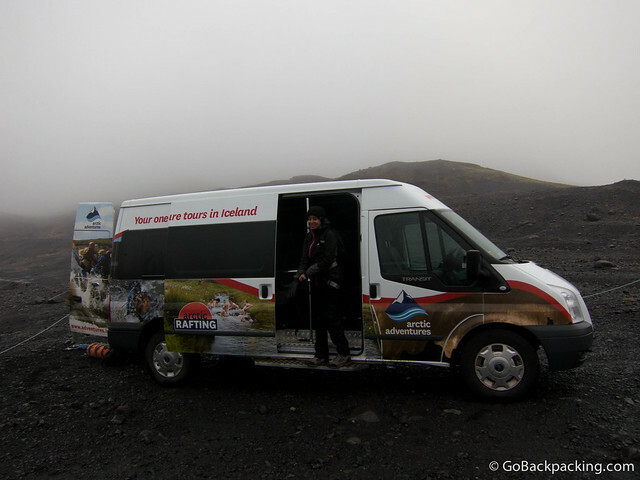 I did the same attraction when in Iceland – It’s a real fun hobby to pursue.